Married Name 31 January 1941 As of 31 January 1941,her married name was Hamblin. Teresene Cleora Cather was born on 31 August 1920 at Marshalltown, Marshall, Iowa. She was the daughter of Clarence Cather and Clara B. Richard. Teresene Cleora Cather married George Edward Hamblin on 31 January 1941 at La Jolla, California. 1 January 1925 Marshalltown Ward 2, Marshall, Iowa Teresene Cleora Cather appeared on the census of 1 January 1925 in the household of Bartle Richard at Marshalltown Ward 2, Marshall, Iowa. Teresene Cleora Cather and George Edward Hamblin lived in 1947 at 704 W Summit, Marshalltown, Marshall, Iowa. Name Variation Katharina Kieler was also known as Catherine. Katharina Kieler was born on 11 March 1877 at Wisconsin. She was the daughter of Frank Kieler and Margaret Koethe. Katharina Kieler died on 14 January 1887 at age 9. Name Variation Mary Elizabeth Kunkel was also known as Elizabeth. Name Variation Mary Elizabeth Kunkel was also known as Elisabeth. 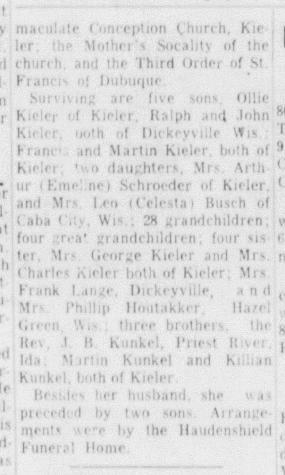 Married Name 22 May 1905 As of 22 May 1905,her married name was Kieler. Mary Elizabeth Kunkel was born on 31 December 1886 at Iowa. Mary Elizabeth Kunkel married Lawrence Kieler, son of Frank Kieler and Margaret Koethe, on 22 May 1905. 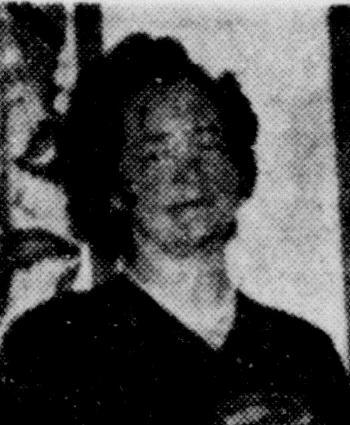 Mary Elizabeth Kunkel witnessed the death of Edward Bernard Kunkel in February 1929 at at home of daughter, Grant, Wisconsin; also reported as Feb 1928 and 10 Oct 1914; Edward B Kunkel obituary. Mary Elizabeth Kunkel died on 26 January 1954 at Grant, Wisconsin, at age 67 Mrs Elizabeth (Kunkel) Kieler, 67, obituary. She was buried after 26 January 1954 at Immaculate Conception Church Cemetery, Kieler, Grant, Wisconsin. On 2 July 1921 at Kieler, Grant, Wisconsin, George and Dorothea (Montag) Kieler 50th wedding anniversary celebration. 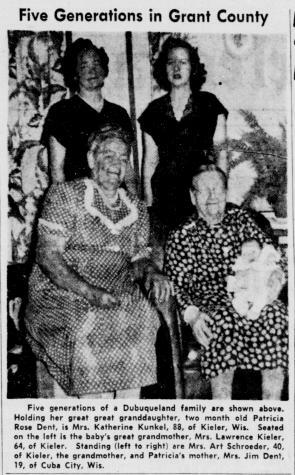 In June 1951 at Grant, Wisconsin, 5 generations - Mrs Katherine (Alt) Kunkel, Mrs. Lawrence (Mary Elizabeth Kunkel) Kieler, Mrs. Art (Emeline Kieler) Schroeder, Mrs. Jim Dent, Patricia Rose Dent. Name Variation Oliver Edward Kieler was also known as Ollie E.
Name Variation Oliver Edward Kieler was also known as Owler. Oliver Edward Kieler was born on 27 March 1906 at Jamestown, Grant, Wisconsin. 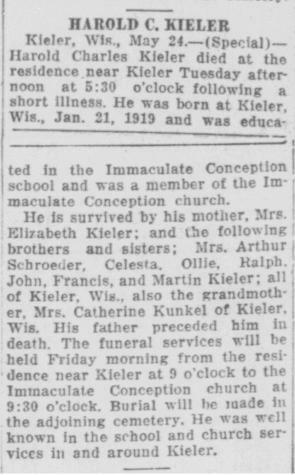 Oliver Edward Kieler married Harriet B. Droessler, daughter of Valentine Droessler and Anna Margaret Thor, on 27 January 1932 at Kieler, Grant, Wisconsin. Oliver Edward Kieler died on 1 March 1994 at Cuba City, Grant, Wisconsin, at age 87. He was buried after 1 March 1994 at Immaculate Conception Church Cemetery, Kieler, Grant, Wisconsin. Ralph W. Kieler was born on 30 October 1908 at Wisconsin. Ralph W. Kieler married Hilda W. Schmitz on 19 January 1937. Ralph W. Kieler died on 18 August 1978 at Grant, Wisconsin, at age 69. He was buried after 18 August 1978 at Holy Ghost Cemetery, Dickeyville, Grant, Wisconsin. Name Variation Emeline A. Kieler was also known as Emily. Married Name 1929 As of 1929,her married name was Schroeder. Emeline A. Kieler was born on 29 June 1910 at Wisconsin. She was the daughter of Lawrence Kieler and Mary Elizabeth Kunkel. Emeline A. Kieler married Arthur Edward Schroeder, son of Benedict Schroeder and Dorothy Kirchberg, in 1929. Emeline A. Kieler died on 5 March 1986 at Wisconsin at age 75. In June 1951 at Grant, Wisconsin, 5 generations - Mrs Katherine (Alt) Kunkel, Mrs. Lawrence (Mary Elizabeth Kunkel) Kieler, Mrs. Art (Emeline Kieler) Schroeder, Mrs. Jim Dent, Patricia Rose Dent. Married Name 25 May 1939 As of 25 May 1939,her married name was Busch. Celesta D. Kieler was born on 26 May 1916 at Kieler, Grant, Wisconsin. 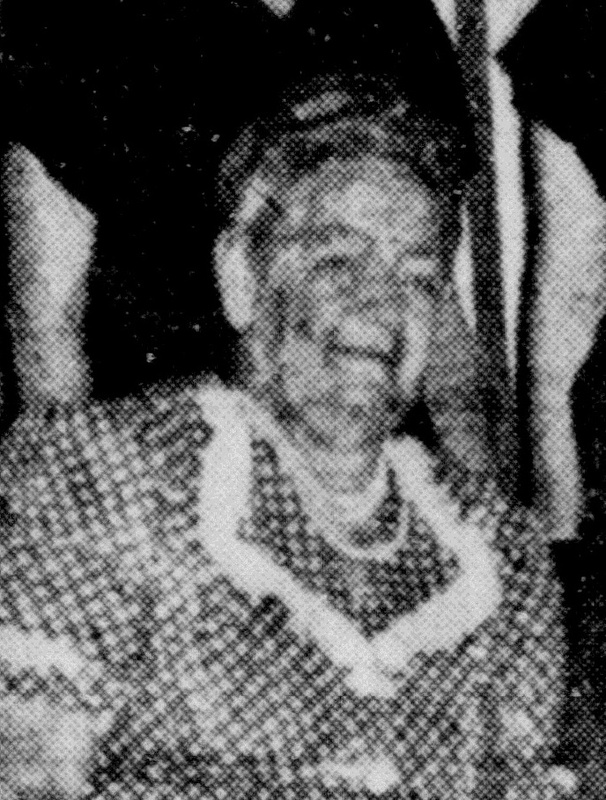 Celesta D. Kieler married Leo John Busch, son of Anton Busch and Barbara Hinderman, on 25 May 1939. Celesta D. Kieler died on 16 April 2014 at Grant, Wisconsin, at age 97. Harold Charles Kieler was born on 21 January 1919 at Wisconsin. Harold Charles Kieler died on 23 May 1933 at Kieler, Grant, Wisconsin, at age 14 Harold Charles Kieler obituary. He was buried after 23 May 1933 at Immaculate Conception Church Cemetery, Kieler, Grant, Wisconsin. 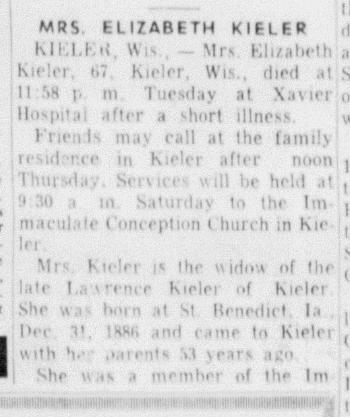 Married Name November 1917 As of November 1917,her married name was Kieler. Amelia Dorothy Weber was born on 4 October 1891 at Kieler, Grant, Wisconsin. She was the daughter of Henry Weber. Amelia Dorothy Weber married Lawrence George Kieler, son of George Kieler and Dorothea Julianna Montag, in November 1917 Amelia Dorothy Weber and Lawrence George Kieler marriage announcement. Amelia Dorothy Weber was buried in August 1950 at Saint Matthews New Catholic Cemetery, Shullsburg, Lafayette, Wisconsin. 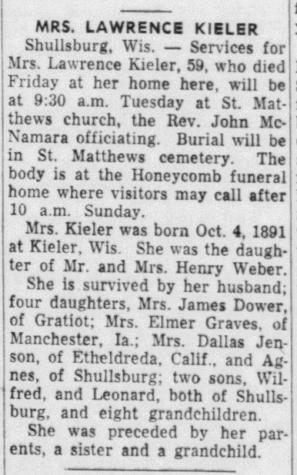 She died in August 1950 at at home, Schullburg, Wisconsin, at age 58 Mrs Lawrence Kieler (Amelia Weber) obituary. On 2 July 1921 at Kieler, Grant, Wisconsin, George and Dorothea (Montag) Kieler 50th wedding anniversary celebration. 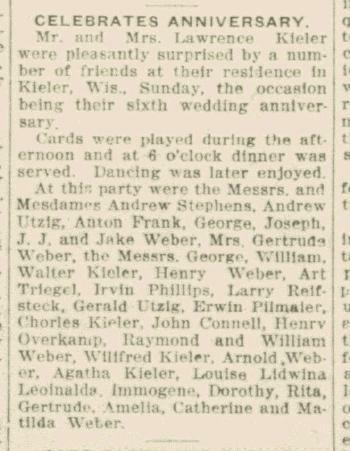 In November 1923 at Kieler, Grant, Wisconsin, attend Lawrence and Amelia (Weber) Kieler 6th anniversary surprise party. Married Name Her married name was Dower. Gertude Kieler married James Dower. Gertude Kieler was born circa 1919. She was the daughter of Lawrence George Kieler and Amelia Dorothy Weber. Joseph Montag married Frances (?). Joseph Montag was born in November 1881 at Wisconsin also reported as Nov 1882. He was the son of John Orrin Montag and Katherine Hinderman. Joseph Montag died in 1974. 1905 Fern Valley, Palo Alto, Iowa Joseph Montag appeared on the census of 1905 in the household of John Orrin Montag at Fern Valley, Palo Alto, Iowa. [S245] U.S. Federal Census 1900 U.S. Federal Census, by Ancestry.com, ED119. Dwelling 125. Name Variation William W. Montag was also known as Willie. William W. Montag was born in March 1885 at Wisconsin. William W. Montag married Eva Rink, daughter of John Rink and C. Remmers, circa 1914. William W. Montag died in 1926 at Iowa. 1905 Fern Valley, Palo Alto, Iowa William W. Montag appeared on the census of 1905 in the household of John Orrin Montag at Fern Valley, Palo Alto, Iowa. [S244] U.S. Federal Census 1910 U.S. Federal Census, by Ancestry.com, Year: 1910; Census Place: Fern Valley, Palo Alto, Iowa; Roll: T624_417; Page: 4B; Enumeration District: 0176; Image: 642; FHL Number: 1374430. [S243] U.S. Federal Census 1920 U.S. Federal Census, by Ancestry.com, Year: 1920;Census Place: Fern Valley, Palo Alto, Iowa; Roll: T625_505; Page: 1B; Enumeration District: 192; Image: 501. Married Name 25 February 1908 As of 25 February 1908,her married name was Bauman. Married Name 25 February 1908 As of 25 February 1908,her married name was Bowman. Regina Montag was born on 30 September 1886 at Paris, Grant, Wisconsin. She was the daughter of John Orrin Montag and Katherine Hinderman. Regina Montag married Jacob Bauman on 25 February 1908. Regina Montag witnessed the burial of Charles F. Kieler on 30 March 1941 at Immaculate Conception Church Cemetery, Kieler, Grant, Wisconsin; Mrs John Montag, Mrs Regina Bowman and Mr and Mrs Leo Montag attended the funeral of a cousin, Charles Kieler, at Dubuque, Sunday. Regina Montag died in 1976 at Iowa. 1905 Fern Valley, Palo Alto, Iowa Regina Montag appeared on the census of 1905 in the household of John Orrin Montag at Fern Valley, Palo Alto, Iowa. 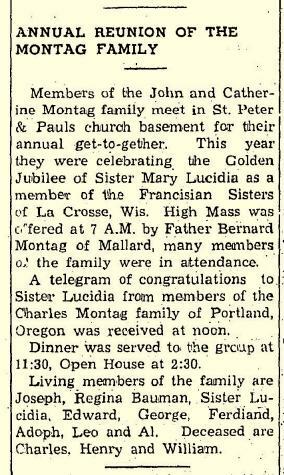 Name Variation Sister Dora Montag was also known as Sister Lucidia. Sister Dora Montag was born on 23 May 1888 at Paris, Grant, Wisconsin. 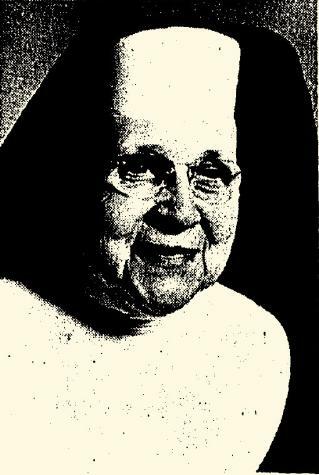 Sister Dora Montag died on 5 February 1976 at age 87 Sister Lucidia Montag obituary. She was buried after 5 February 1976 at Catholic Cemetery of La Crosse, La Crosse, La Crosse, Wisconsin. 1905 Fern Valley, Palo Alto, Iowa Sister Dora Montag appeared on the census of 1905 in the household of John Orrin Montag at Fern Valley, Palo Alto, Iowa. 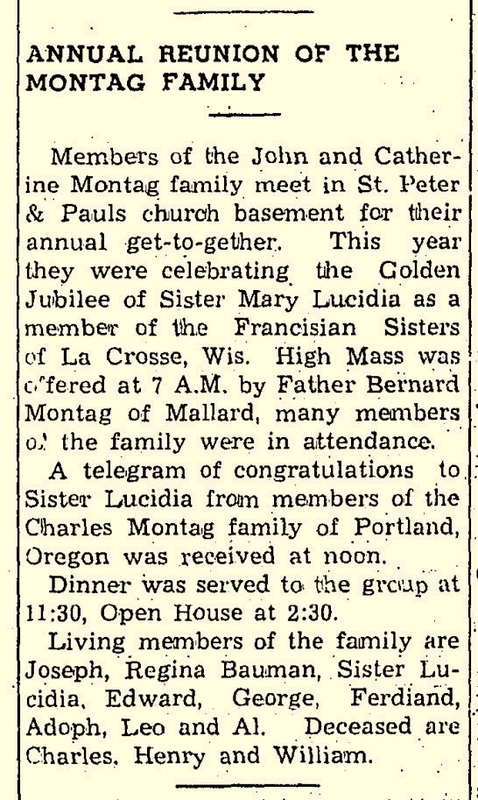 In June 1965 Montag family reunion and Golden Jubilee of Sister Mary Lucidia. Name Variation Edward V. Montag was also known as Edward D. W.
Edward V. Montag was born in June 1892 at Wisconsin. Edward V. Montag married Alice Forgarty, daughter of Daniel Forgarty and Ella Duffe, before 1924. Edward V. Montag died on 27 June 1965 at Iowa. 1905 Fern Valley, Palo Alto, Iowa Edward V. Montag appeared on the census of 1905 in the household of John Orrin Montag at Fern Valley, Palo Alto, Iowa. 1 January 1925 West Bend, Palo Alto, Iowa Edward V. Montag appeared on the census of 1 January 1925 at West Bend, Palo Alto, Iowa. George W. Montag was born on 29 March 1895 at Wisconsin. George W. Montag married Izma M. Tucker, daughter of Henry L. Tucker and Eva B. (? ), circa 1923. George W. Montag died in December 1967 at age 72. 1905 Fern Valley, Palo Alto, Iowa George W. Montag appeared on the census of 1905 in the household of John Orrin Montag at Fern Valley, Palo Alto, Iowa. 1 January 1925 West Bend, Palo Alto, Iowa George W. Montag appeared on the census of 1 January 1925 in the household of John Orrin Montag at West Bend, Palo Alto, Iowa. 1 January 1925 Fern Valley, Palo Alto, Iowa George W. Montag appeared on the census of 1 January 1925 at Fern Valley, Palo Alto, Iowa. [S243] U.S. Federal Census 1920 U.S. Federal Census, by Ancestry.com, Year: 1920;Census Place: Fern Valley, Palo Alto, Iowa; Roll: T625_505; Page: 4B; Enumeration District: 192; Image: 507. [S250] U.S. Federal Census 1930 U.S. Federal Census, by Ancestry.com, Year: 1930; Census Place: West Bend, Palo Alto, Iowa; Roll: 671; Page: 2A; Enumeration District: 25; Image: 2284.0. Name Variation Ferdinand F. Montag was also known as F.
Ferdinand F. Montag was born on 2 February 1897 at Iowa. Ferdinand F. Montag married Mary M. (?) circa 1926. Ferdinand F. Montag died on 8 November 1979 at Iowa at age 82. 1905 Fern Valley, Palo Alto, Iowa Ferdinand F. Montag appeared on the census of 1905 in the household of John Orrin Montag at Fern Valley, Palo Alto, Iowa. 1 January 1925 Fern Valley, Palo Alto, Iowa Ferdinand F. Montag appeared on the census of 1 January 1925 in the household of George W. Montag at Fern Valley, Palo Alto, Iowa. [S373] U.S. Federal Census 1940 U.S. Federal Census, by Ancestry.com, Year: 1940; Census Place: Fern Valley, Palo Alto, Iowa; Roll: T627_1189; Page: 1A; Enumeration District: 74-8. Adolph Henry Montag was born on 16 December 1898 at Iowa. Adolph Henry Montag married Laurette Brodigan, daughter of Pat Brodigan and Margret Walsh, circa 1924. Adolph Henry Montag died in August 1973 at Iowa at age 74. 1905 Fern Valley, Palo Alto, Iowa Adolph Henry Montag appeared on the census of 1905 in the household of John Orrin Montag at Fern Valley, Palo Alto, Iowa. 1 January 1925 West Bend, Palo Alto, Iowa Adolph Henry Montag appeared on the census of 1 January 1925 at West Bend, Palo Alto, Iowa. On 12 September 1918 at World War I Draft Registration, Palo Alto, Iowa. Leo F. Montag was born on 19 September 1901 at Iowa. As of 1930, Leo F. Montag was never married. He married Meriam S. (?) after April 1930. Leo F. Montag witnessed the burial of Charles F. Kieler on 30 March 1941 at Immaculate Conception Church Cemetery, Kieler, Grant, Wisconsin; Mrs John Montag, Mrs Regina Bowman and Mr and Mrs Leo Montag attended the funeral of a cousin, Charles Kieler, at Dubuque, Sunday. Leo F. Montag died in January 1987 at age 85. 1905 Fern Valley, Palo Alto, Iowa Leo F. Montag appeared on the census of 1905 in the household of John Orrin Montag at Fern Valley, Palo Alto, Iowa. 1 January 1925 West Bend, Palo Alto, Iowa Leo F. Montag appeared on the census of 1 January 1925 at West Bend, Palo Alto, Iowa. [S250] U.S. Federal Census 1930 U.S. Federal Census, by Ancestry.com, Year: 1930; Census Place: West Bend, Palo Alto, Iowa; Roll: 671; Page: 5B; Enumeration District: 25; Image: 2291.0. Name Variation Aloysius Montag was also known as Aloysious. Aloysius Montag was born on 27 March 1904 at Iowa. Aloysius Montag married Agnes I. (?) circa 1928. Aloysius Montag died in July 1966 at age 62. 1905 Fern Valley, Palo Alto, Iowa Aloysius Montag appeared on the census of 1905 in the household of John Orrin Montag at Fern Valley, Palo Alto, Iowa. 1 January 1925 West Bend, Palo Alto, Iowa Aloysius Montag appeared on the census of 1 January 1925 in the household of John Orrin Montag at West Bend, Palo Alto, Iowa. Aloysius Montag obtained US Social Security Card at Iowa; last residence not specified. [S250] U.S. Federal Census 1930 U.S. Federal Census, by Ancestry.com, Year: 1930; Census Place: West Bend, Palo Alto, Iowa; Roll: 671; Page: 6A; Enumeration District: 25; Image: 2292.0. Joseph Hinderman married Regner Hellburg. Joseph Hinderman was born circa 1823 at Prussia. Name Variation Regner Hellburg was also known as Regina. Regner Hellburg married Joseph Hinderman. Regner Hellburg was born circa 1823 at Germany. Married Name circa 1928 As of circa 1928,her married name was Montag. Agnes I. (?) was born circa 1903 at Iowa. She married Aloysius Montag, son of John Orrin Montag and Katherine Hinderman, circa 1928. Name Variation Theresa Clara Dunck was also known as Trace. Name Variation Theresa Clara Dunck was also known as Theresa Margaret. Name Variation Theresa Clara Dunck was also known as Thresia. Name Variation Theresa Clara Dunck was also known as Tracy C.
Name Variation Theresa Clara Dunck was also known as Durick. Name Variation Theresa Clara Dunck was also known as Teresa. Name Variation Theresa Clara Dunck was also known as Tracy R.
Married Name 28 August 1901 As of 28 August 1901,her married name was Montag. Theresa Clara Dunck was born on 18 June 1878 at Iowa also reported as 18 Jun 1879. Theresa Clara Dunck married Charles John Montag, son of John Orrin Montag and Dorathea Richard, on 28 August 1901 at Iowa City, Wright, Iowa. Theresa Clara Dunck died on 12 August 1937 at Portland, Multnomah, Oregon, at age 59 Mrs. Theresa (Dunck) Montag obituary. Theresa Clara Dunck had 4 with 4 living in 1910 children. [S244] U.S. Federal Census 1910 U.S. Federal Census, by Ancestry.com, Year: 1910; Census Place: Portland Ward 10, Multnomah, Oregon; Roll: T624_1287; Page: 18A; Enumeration District: 0236; Image: 932; FHL Number: 1375300. [S243] U.S. Federal Census 1920 U.S. Federal Census, by Ancestry.com, Year: 1920;Census Place: Portland, Multnomah, Oregon; Roll: T625_1503; Page: 8B; Enumeration District: 191; Image: 679. [S250] U.S. Federal Census 1930 U.S. Federal Census, by Ancestry.com, ED28. Dwelling 88. Married Name circa 1928 As of circa 1928,her married name was Sage. Ruby Frances Montag was born on 15 December 1902 at Iowa. She was the daughter of Charles John Montag and Theresa Clara Dunck. Ruby Frances Montag married John Edward Sage circa 1928. Ruby Frances Montag died on 28 January 1987 at Oregon at age 84. Name Variation Henry Octave Montag was also known as Octavia Henry. Henry Octave Montag was born on 19 August 1904 at Iowa. He was the son of Charles John Montag and Theresa Clara Dunck. Henry Octave Montag married Eva McKey on 27 June 1926. Henry Octave Montag died on 7 December 1974 at Hawaii at age 70. Henry Octave Montag obtained US Social Security Card at Oregon; last residence Lake Oswego, Clackamas, Oregon. 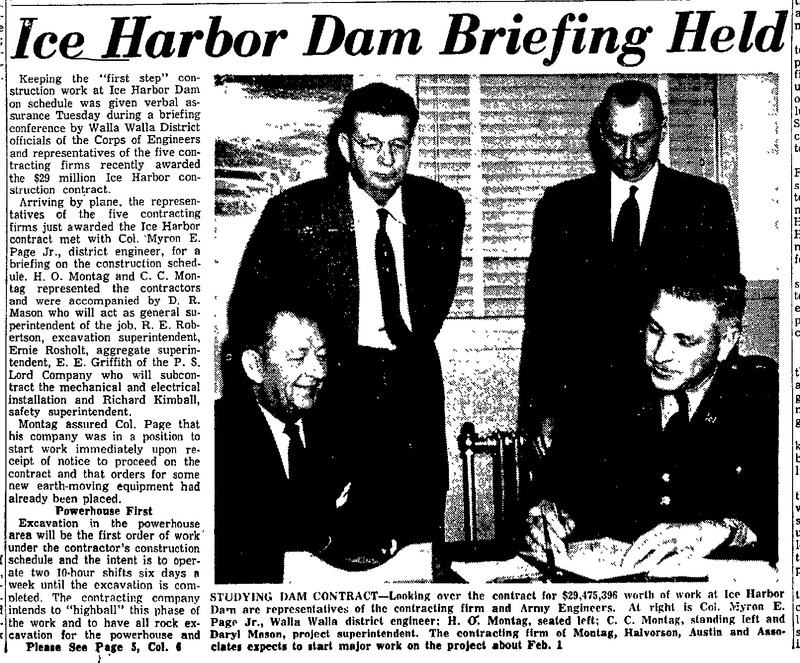 In January 1957 at Oregon Article: Ice Harbor Dam Briefing Held including H. O. Montag and C. C. Montag. [S250] U.S. Federal Census 1930 U.S. Federal Census, by Ancestry.com, Year: 1930; Census Place: Portland, Multnomah, Oregon; Roll: 1954; Page: 4B; Enumeration District: 0533; Image: 842.0; FHL microfilm: 2341688. [S373] U.S. Federal Census 1940 U.S. Federal Census, by Ancestry.com, Year: 1940; Census Place: Portland, Multnomah, Oregon; Roll: T627_3393; Page: 62A; Enumeration District: 37-479. Name Variation Jewell K. Montag was also known as Juliet. Name Variation Jewell K. Montag was also known as Jule F.
Jewell K. Montag was born on 15 February 1906 at Iowa. As of 1976, Jewell K. Montag was never married. She died on 7 January 1976 at Multnomah, Oregon, at age 69. [S373] U.S. Federal Census 1940 U.S. Federal Census, by Ancestry.com, Year: 1940; Census Place: Lapine, Deschutes, Oregon; Roll: T627_3359; Page: 4B; Enumeration District: 9-10. Clyde Charles Montag married Mary Louise (?). Clyde Charles Montag was born on 16 February 1908 at Oregon also reported as Washington. Clyde Charles Montag died on 14 April 1971 at Multnomah, Oregon, at age 63. 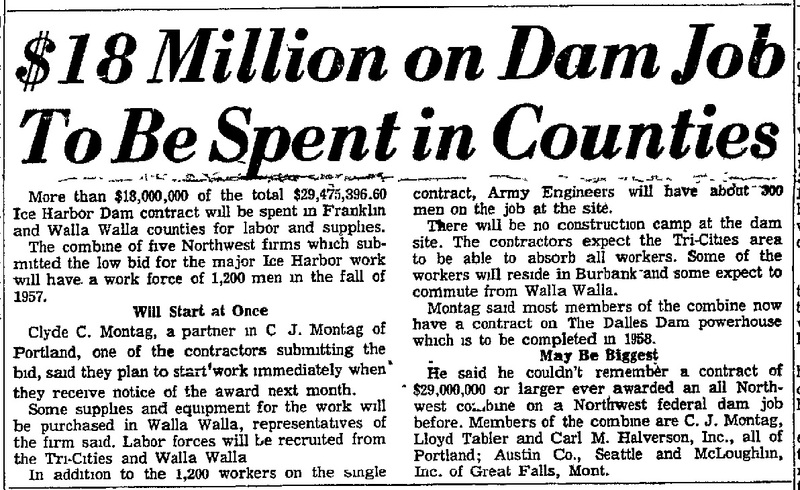 In December 1956 Ice Harbor Dam contract includes work by Clyde C. Montag and C. J. Montag of Portland. 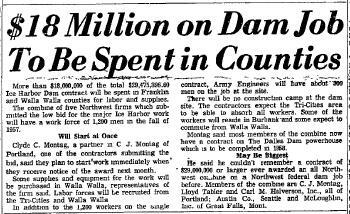 Walla Walla Union Bulletin December 23, 1956 - Ice Harbor Dam contract includes work by Clyde C. Montag and C. J. Montag of Portland. In January 1957 at Oregon Article: Ice Harbor Dam Briefing Held including H. O. Montag and C. C. Montag. Married Name Her married name was Montag. Mary Louise (?) married Clyde Charles Montag, son of Charles John Montag and Theresa Clara Dunck. Mary Louise (?) was born circa 1912 at Oregon. Name Variation John Edward Sage was also known as Pat. John Edward Sage was born circa 1903 at Washington. He married Ruby Frances Montag, daughter of Charles John Montag and Theresa Clara Dunck, circa 1928.